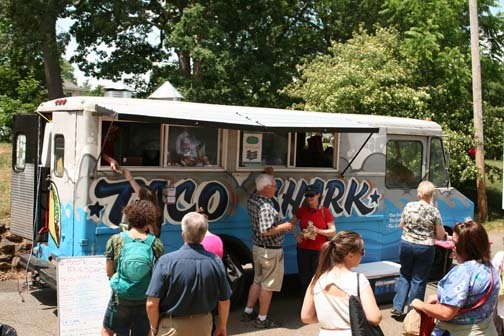 Taco Shark was one of Lynchburg, Virginia’s first food trucks, opening in 2013, in downtown Lynchburg. 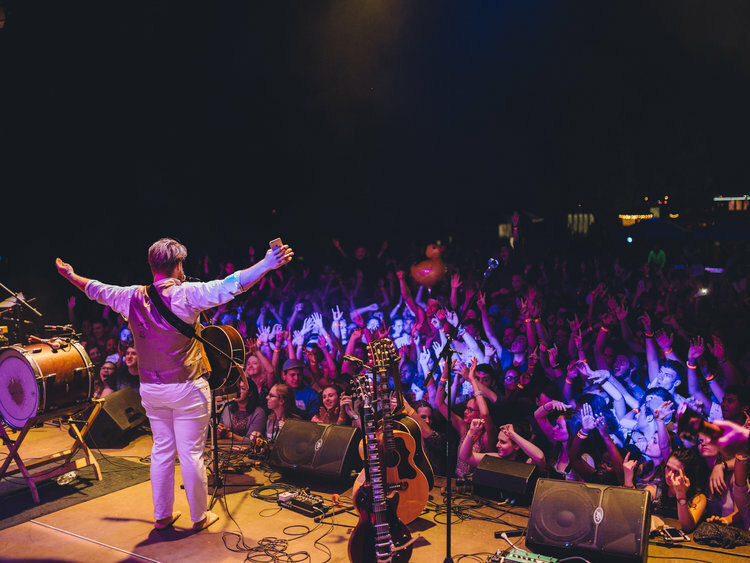 They can still be found on Main Street or in Miller Park at Food Truck Thursdays. Taco Shark carries traditional tacos with chicken, steak and even tofu. But it’s their untraditional ingredients that keep their customers coming back for more or to try a new taco sensation. Have you had barbeque pulled pork, chorizo sausage and sweet potatoes in a corn or flour tortilla? Top your taco with roasted corn, black bean salsa, fresh-made pico de gallo and chipotle crema. They almost always offer a vegetarian option or two. The menu is constantly changing so that customers can try something new or stick with their old favorite. But one thing is for sure, you want to visit this food truck often, coming back for more. A new food truck, Jacked Rabbit, has been added to the ever increasing selection of food trucks found in and around Lynchburg, VA.
Jacked Rabbit can’t be missed, either at the corner of Main and 12th at the Lynchburg Community Market or in Miller Park on Thursdays with the other local food trucks that participate in Food Truck Thursdays. 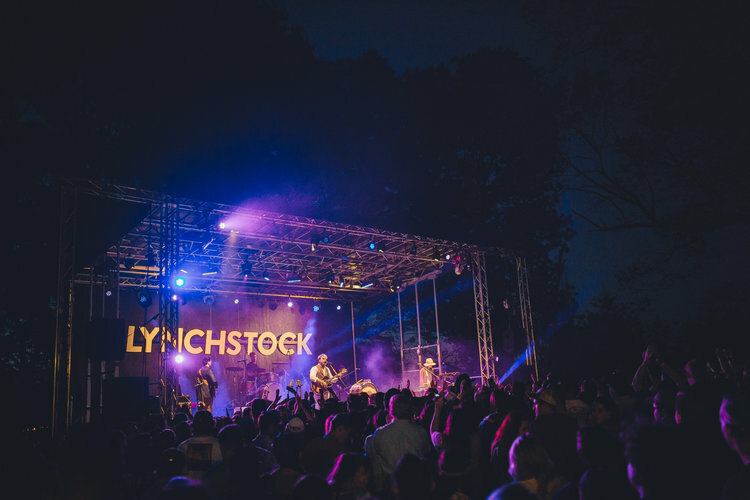 Painted with bright pinks, oranges, teals and abstract designs you know you have found something a bit different, especially for Lynchburg. 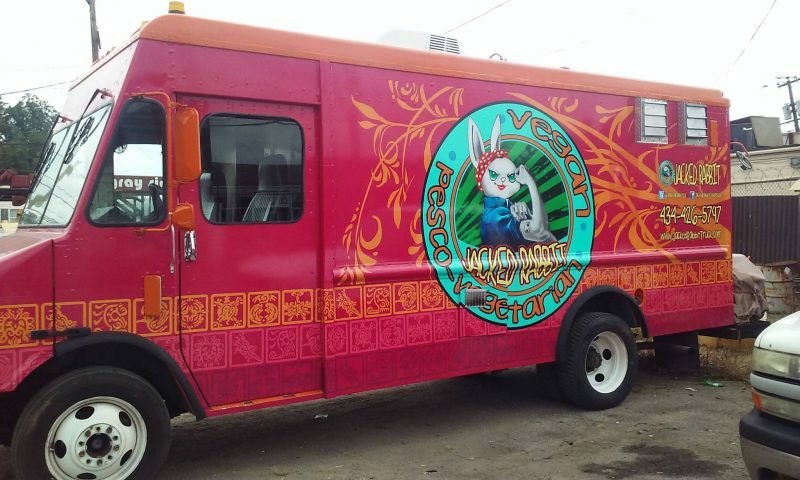 And it is…..Lynchburg’s first vegan food truck and one of the few vegan options in the city. Serving a vegan/pesco-vegetarian menu the food served combines flavors from Peru, Asia, the Caribbean, Spanish cultures and the American South. The chef, Loralee, attended CVCC’s culinary school. She worked for awhile at MachuPichu. International cuisines allow her to create interesting dishes that you won’t find anywhere else in Lynchburg. And customers are glad she is here. 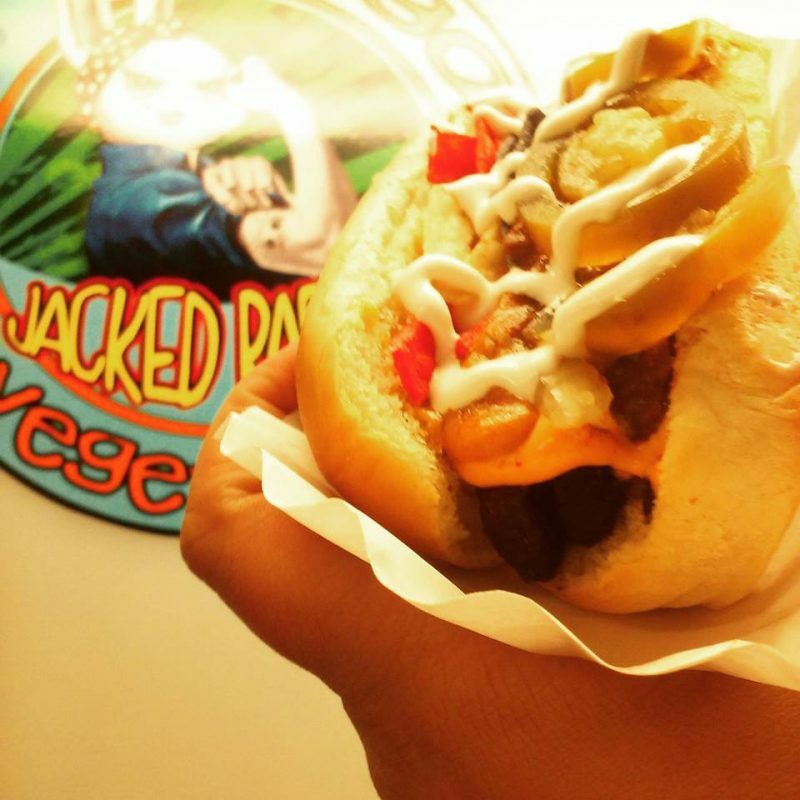 Jacked Rabbit serves vegan and vegetarian foods. A few of her most popular dishes are: Tostones, Puerto Rican twice-fried plantain slices that are covered with a Peruvian-style salsa and citrus-onion salad, the Jackfruit BBQ Sandwich, which is made from a cooked down Asian Jackfruit, topped with fried pickles, slaw and onions on a bun or the Big Fat Banh Mi sandwich which is a a play on the traditional Vietnamese dish. Instead of pork Loralee cooks tofu three ways which changes it’s texture and gives the eater a sense of eating cooked pork. Now that it is summer she is offering ceviche and seafood. She would like to add tropically flavored cold-pressed juices, like berry-basil and mango-pineapple-orange-kiwi in the near future. As you travel around Lynchburg be on the lookout for a rabbitized version of Rosie the Riveter. When you find a rabbit wearing the classic blue shirt pulled up to expose a bunny skull tattoo on her flexed arm and the famous polka dot bandana tucked around her long ears you will know you have found it. Give it a try, you just might be pleasantly surprised and thankful to have been exposed to something new and different to eat. Guests staying at The Carriage House Inn Bed and Breakfast often tell us they don’y need lunch, after eating one of our 4-course breakfasts, but it’s nice to know there is another option for lunch or an early afternoon snack, if you need one.